Arizona 100: Essential Books for the Centennial | Notes on a Military Reconnaissance, from Fort Leavenworth, in Missouri, to San Diego, in California, Including Parts of the Arkansas, Del Norte, and Gila Rivers. Notes on a Military Reconnaissance, from Fort Leavenworth, in Missouri, to San Diego, in California, Including Parts of the Arkansas, Del Norte, and Gila Rivers. 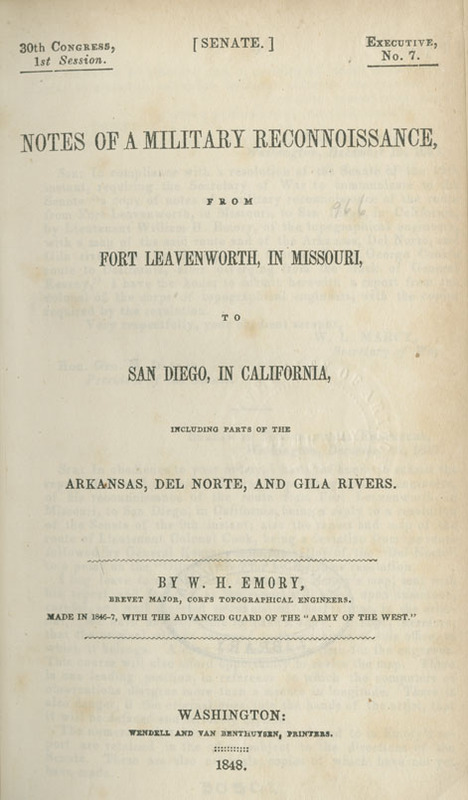 Emory, William H , “Notes on a Military Reconnaissance, from Fort Leavenworth, in Missouri, to San Diego, in California, Including Parts of the Arkansas, Del Norte, and Gila Rivers. ,” Arizona 100: Essential Books for the Centennial, accessed April 21, 2019, http://speccoll.library.arizona.edu/online-exhibits-dynamic/az100/items/show/159. Assigned as a thirty-five-year-old topographical engineer to accompany Brig. Gen. Stephen Watts Kearney’s Army of the West on its invasion of what were then the northern reaches of Mexico, Emory (1811-1887) provides an informed eyewitness account of the military campaign that crossed present-day southern Arizona along the Gila River to the Yuma Crossing, along with the first American scientific description of the people, geography, and botany of the region (including the first accurate map). 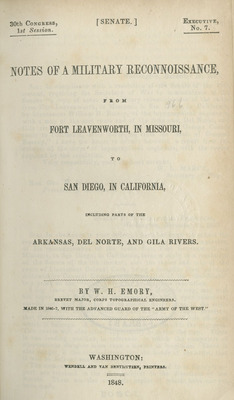 As readable today as it was 175 years ago, Emory’s report, with illustrations by noted artist John Mix Stanley, provided nineteenth-century civilians and statesmen with their initial view of the territory annexed after the U.S.-Mexico War and provided the baseline for future exploration of the Southwest borderlands. Washington, D.C. : Wendell and Van Bertuysen, 1848. 416 p. plates. 23 cm.